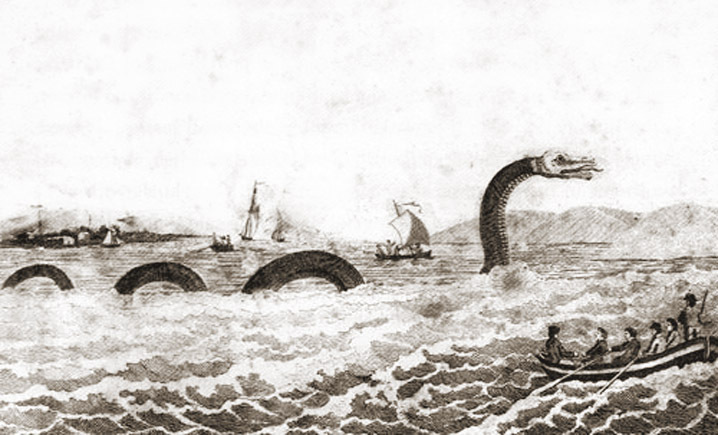 In 1817, reports spread throughout New England of a sea serpent sighted in Gloucester Harbor. The Linnaean Society of New England collected evidence and published a pamphlet in which it announced the discovery of an entirely new genus, the Scoliophis Atlanticus. 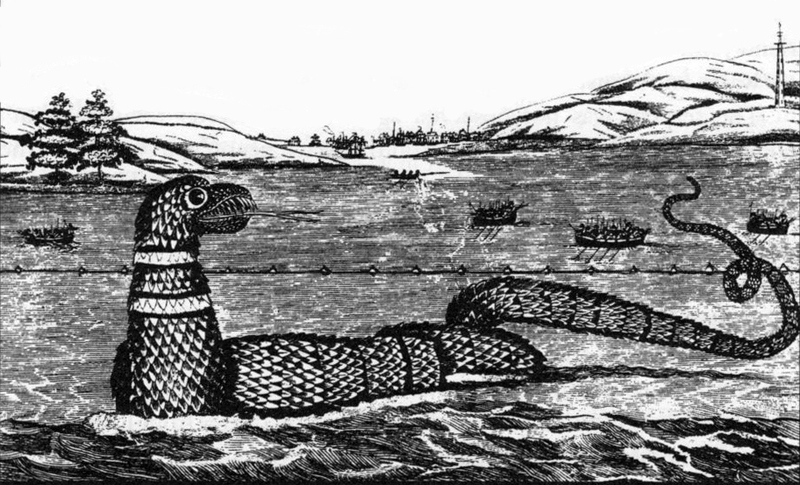 There were mass sightings of a serpent off the coast of Nahant in 1819. A similar creature attacked a British sailing ship, the British Banner in 1859. General David Humphreys traveled to Gloucester to interview witnesses. 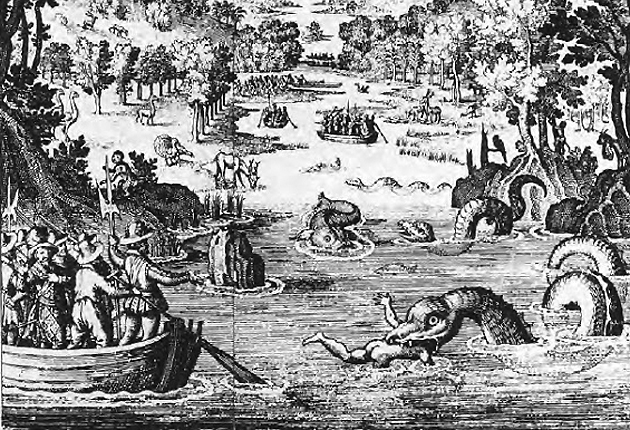 Witnesses said that the creature was 60 to 70 ft. long and that it’s head, which it held above the water, had a spear about twelve inches in height, and six inches in circumference at the base. It moved rapidly in a serpentine fashion, was very agile and no one had been able to kill it. “There is one topic with which the annals of Nahant are inseparably associated that we feel a natural diffidence in approaching, yet cannot in conscience ignore, and that is the sea serpent. Words are inadequate to describe the wide-spread consternation which the apparition of such a monster created among the hardy population of our New England seaboard. He was soon perceived to possess none of the attributes of sportive and harmless fish but to belong strictly to the reptile tribe. And what a reptile! The most exaggerated reports of his length prevailed throughout all the fishing towns of Cape Ann and up and down the length of the coast. One skipper swore that he was as long as the main mast of a seventy-four; another would eat him if the steeple of Gloucester meeting could hold a candle to him for length. The sea monster appeared again off Nahant in July 1833. Image from “Sea and land : an illustrated history of the wonderful and curious things of nature existing before and since the deluge” by Buel, James W. (James William), 1849-1920. 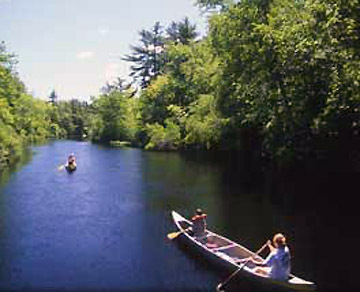 ” I, the undersigned, Gresham Bennett, second master, declare that on the 6th of June at 7 a.m., while navigating on board the sloop Concord, on her way from New York to Salem, the vessel being about fifteen miles from Race Point, in sight of Cape St. Anne, I heard the helmsman cry out and call me, saying that there was something close to the ship well worth looking at. I ran immediately to the side he pointed out and saw a serpent of enormous magnitude floating on the water. Its head rose about seven feet above the surface; the weather was clear and the sea calm. The color of the animal in all its visible parts was black, and the skin appeared smooth and free from scales. Its head was about as long as that of a horse, but was the perfect head of a serpent, terminating on the upper part in a flattened surface. We could not distinguish its eyes. After the age of motorized ocean travel reports of a sea serpent subsided, and it has been speculated that if such creatures existed they may have been warned off by the sounds of ship engines. Reported sightings have continued to this day in Nova Scotia. 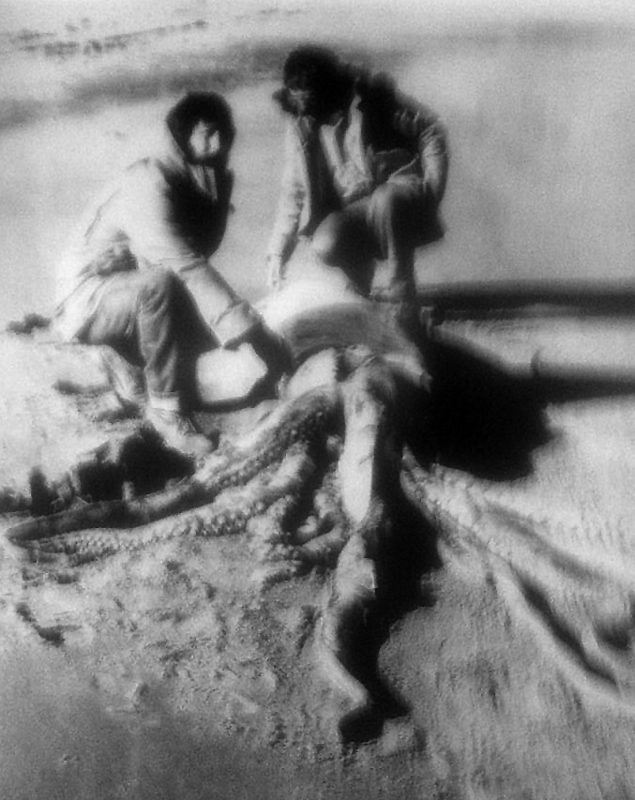 On Sunday, November 15, 1970, a “sea monster” washed ashore at Scituate south of Boston. In the next three days over 10,000 people saw the creature. Discoverers of the carcass claimed it was at least 50 feet long, but souvenir seekers hacked off many pieces before authorities from the New England Aquarium arrived to investigate. Assistant Refuge Manager Al Zelly with Refuge officer Bill Papoulios, who discovered the giant squid on Plum Island. It could be that some of the sightings were of a giant squid similar to the one that washed up on Plum Island in 1980. Sightings of the giant squid or “Kraken” have been reported for centuries but the creature was long considered to be mythological. In the 18th Century, Erik Pontoppidan, bishop of Bergen in his book “The Natural History of Norway” claimed that the kraken was sometimes mistaken for an island and that ships could be sunk by the whirlpool left in its wake. The massive giant squid has eight arms and two long tentacles, but was rarely seen and never taken seriously by the scientific community until it was categorized by Danish zoologist Johan Steenstrup in the 1840’s. A squid estimated at 30 ft. long was captured near St. John’s Newfoundland in 1873, and three years later a 65 ft. specimen was found in New Zealand. Perhaps the giant squid accounts for some of the reports of “sea monsters” off the coast of Massachusetts in the 17th and 18th Centuries. In 1980 a giant squid was discovered on the Plum Island beach about 3.5 miles south of the entrance to the Parker River Wildlife Refuge in a section that is part of Rowley. The specimen was a female weighing 440 lbs. Had the two feeding tentacles not been missing, it would have measured about 30 ft. It was the third body of a giant squid to be found on U.S. shores.